Hiawatha Community Hospital's highest priority is the provision of quality health care to our patients throughout Northeast Kansas. Comprehensive services include primary, secondary and long term care. To carry out this mission, health professionals within the hospital continually work together to improve patient care and education. This team approach ensures that our patients will benefit from the most up to date medical practices available. The hospital can only continue to exist to service its mission through sound financial management and strategic planning. Therefore, the principles of cost effectiveness and efficiency govern the development of health care policy for the hospital. External and internal assessments are done to determine evolutionary needs and to respond to the demands of every changing technology. Hiawatha Community Hospital feels a strong commitment to its employees and strives always to treat them fairly, responsibly and with a sense of concern for their well-being. The provision of comprehensive continuing education is essential to maintain adequate skill levels and foster a sense of pride and professionalism. As a community hospital, Hiawatha Community Hospital recognizes its responsibility to provide public health education and as such, strives to serve as a regional health resource center. Medical and professional staffs are encouraged to participate in community activities and education. 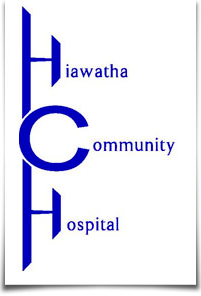 "Hiawatha Community Hospital, Caring for you and our community"